These drains connect to the downspouts and consist of a non-perforated solid pipe. They only have one job: transport water from the inlet (at the downspout) to an outlet in a downhill area away from your home. They can consist of 4“ corrugated solid pipe or 4“ schedule 40 PVC pipe. Both types of pipe will do the job the same. However, the schedule 40 PVC pipe is designed to go under driveways and walkways and has the highest load handling capacity. The 4“ corrugated pipe has the highest flexibility for turns and elevation changes and can still handle the weight of riding mowers and light equipment. This makes it the most versatile pipe of the two. Many properties have areas where water collects and stands, creating a nuisance to walk through or mow. Usually, underlying grass cannot grow properly submerged underwater. Therefore, installing an interceptor catch basin or a French drain to intercept water before it has a chance to fill these low-lying areas. After the initial interceptor area of the pipe or box, the remaining drain pipe is usually solid so that the water can be transported to a downhill area. 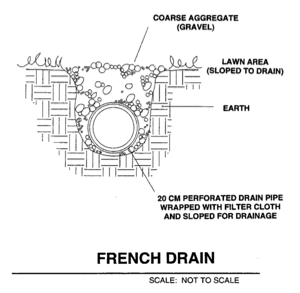 French drains are basically a trench with a thin layer gravel on the bottom, a perforated, silt-jacketed pipe with gravel and earth on top of it. These drains are usually installed in a wide-angle curve or up against a building or driveway and will intercept water as it runs over it. The benefit of these drains is that they are virtually invisible in your yard, yet can take massive amounts of water through the soil and gravel on top of the pipe. Catch basins are capable of collecting hundreds of gallons of water. They are usually installed in bowl-shaped depressions in your yard, or in very flat areas where water converges like side yards, walkways, and driveways. These boxes are easily to maintain because the top grate is removable so it is easy to clean out dirt and sediment that can collect in the bottom. The drain line connected to the box is a solid 4″ or 6″ pipe, depending on the volume of water you’re trying to remove. The most important type of drain for a house is a foundation drain. This drain’s only job is to keep water away from the foundation of your home. It intercepts water from outside the foundation wall and channels it away from the house. Foundation drains are a closed system and do not connect to any other drainage system.